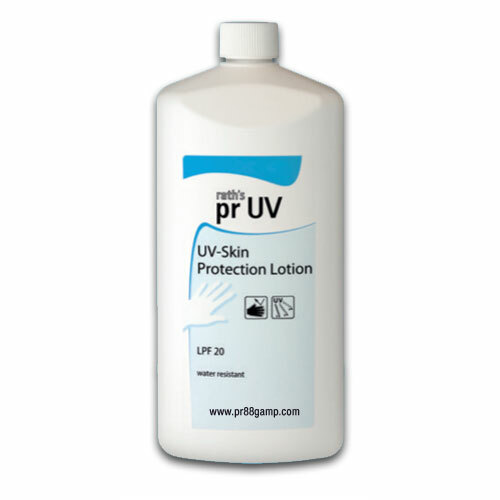 prUV Ultra Violet Skin Protection (1 Liter) | pr88 / GAMP Inc.
prUV protects your hands against:UVA-, UVB- and UVC-rays when exposed to intensive sun radiation and against technical UV radiation sources (e.g. electric arc welding). prUV is the first preparation that, with a light factor of 20 (spf 40), offers high protection in the UVA, UVB, and UVC ranges with a single, inorganic, dermatologically harmless filter substance. Originally, prUV was designed as a special protective preparation against UVC radiation for electric welders, but in addition, the protection against UVA radiation, which is more hazardous than previously assumed, should be emphasized here. Apart from the protective effect of prUV in the UVA and UVC ranges, the correlation of the LPF values of common sun protecting agents determined according to DIN shows excellent conformity with so-called monochromatic protection factors. prUV does not contain preservatives, coloring or silicones. HOW DOES prUV BENIFIT THE SKIN? prUV is formulated as a W/O emulsion so that even with intense perspiration and when swimming, no “rinsing away” of the preparation occurs. This is a great advantage compared to O/W emulsions. It has increased skin compatibility due to the anti-inflammatory properties of zinc oxide and vitamin E-acetate as well as the non-usage of preservatives. Apply before exposure to sunlight or UV radiation. For all areas of the skin including the face. Rub in the lotion evenly until white traces disappear. After washing with soap and drying, application must be repeated.